I type this post while watching the second quarter of the Cowboys-Giants game (DVR’ing Breaking Bad– decisions, decisions). I love watching a good football game, especially when it’s not a Jets game. My poor husband, a lifelong Jets fan, suffers season after season watching the Jets. Sometimes there’s cursing and yelling involved. Even though the Jets won today, we know better than to get our hopes up. Anyway, football is so much more fun when your team isn’t playing. Ouch! Romo just went down and is being helped off the field, meanwhile, the camera shows the Cowboys owner, Jerry Jones, sitting next to New Jersey’s very own Chris Christie. New Jersey is everywhere, people! But I digress . . . This weekend, a few fun things happened (besides our first NFL Sunday and a Jets win). Fun Thing Number One is that yesterday an idea I submitted to The Daily Post for a Daily Prompt was used! The prompt was to name a luxury you can’t live without. You can see the post here. I was thinking about my cleaning lady when I came up with the idea. I also thought about Spaceballs when Princess Vespa whips out her hair dryer and says, “It’s my Industrial Strength Hair Dryer, and I CAN’T LIVE WITHOUT IT!” In response to the Prompt people wrote lovely thoughts. Some luxuries mentioned were coffee, the internet, families, and look at these desserts from Barcelona that my Blog Sister, the Public Transit User, featured. Wowzers. 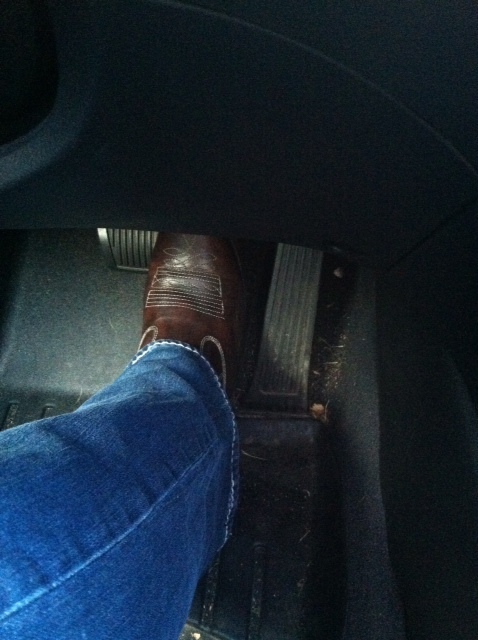 My foot driving the “fancy car” in a cowboy boot! 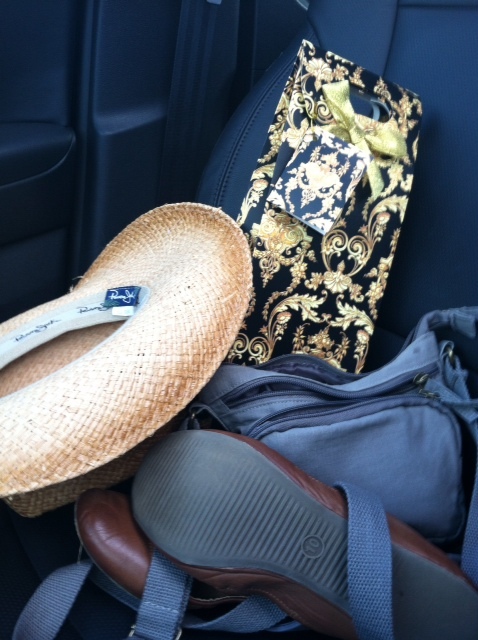 My stuff for the party- a cowboy hat, a gift bag containing a bottle of champagne, my purse (mostly to carry my lipstick), and flats for when my boots started to annoy me. I have to admit that I didn’t ride the bull and left before the cake, but seeing my friend celebrate her birthday and tripping down memory lane made for a lovely night. This morning I partook in Fun Thing Number Three. Yoga. But during this yoga class, Stretchy Woman (my beloved teacher) decided we would do yoga up against the wall. “Wall Yoga,” she called it. Practicing in this way is quite enlightening in that you feel your alignment and different angles of your body when certain parts of it are pressed against the flat wall, and you get to do fun things like hold yourself upside down and walk your legs up the wall and really feel your shoulders and arms working to hold you up. It was interesting to try. Garbage bags. Getting rid of the train table. Thank God for Hefty! Haven’t tackled the books yet. Help! 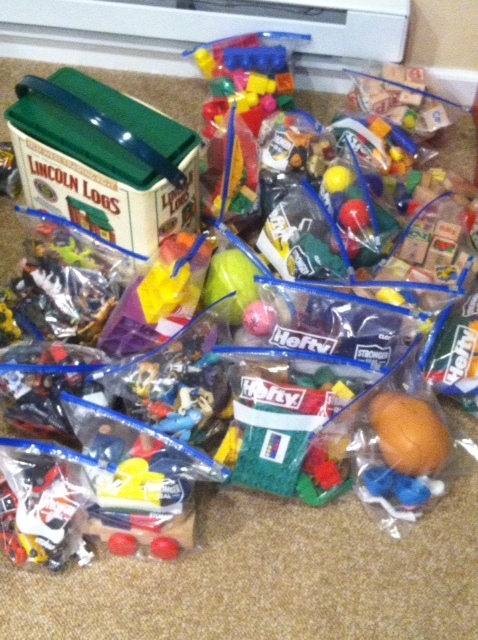 Packed like items into gallon ziplock bags to donate. 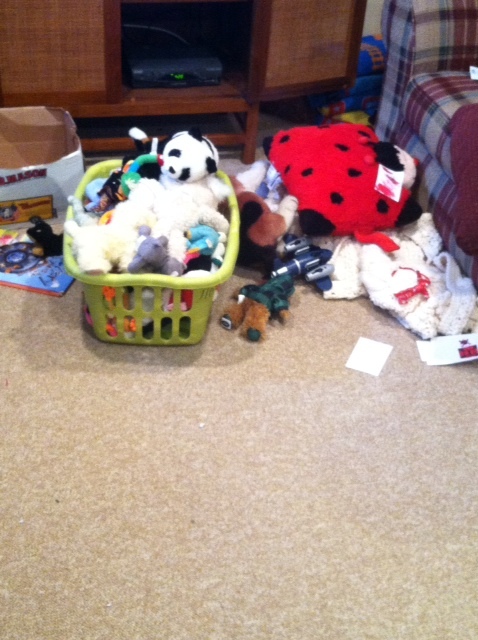 And still have to figure out the stuffed animals . . .
That’s what I did this weekend, and here it is late Sunday night and tomorrow is another Monday. I’m hoping tomorrow will be my Magnificent Made-Up Men of Monday inaugural post (featuring Lloyd Dobler, as promised). I’ll try. I have a similar basement project waiting for me. It won’t be pretty. No, not at all. I commend you on the cowboy hat, boots, and being in riding distance of a bull, mechanical or otherwise. Sounds like a pretty decent weekend! Basement projects are not fun. Thanks for commending me on my attempts at country stuff. I did eat the smoked meats, so that worked out. With the bull I kept thinking that I’d be really mad at myself if I tried it and then got hurt. I don’t blame you. I would even be hesitant with the boots. I’m fragile like that. A mechanical bull? No way. You crack me up. 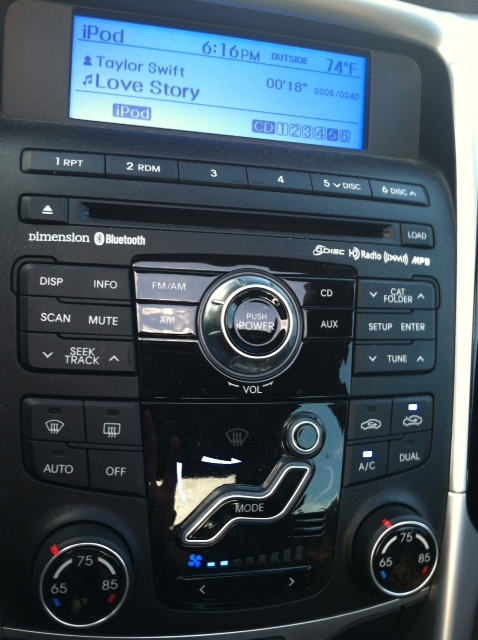 I LOVE that you took a picture of your cowboy boot in the Sonata. 🙂 I was so shocked to be wearing them that I had to document it! The Jets did barely squeak by with that win – but a win is a win! I can say that cause I’m a Cowboy fan… and we say that all the time – a win is a win! 🙂 Our game was super exciting – and my fav part? when the announcers said several times that the poor playing was a result of the fewer practices (duh) that the players union negotiated. Really? Fewer practices is why both teams sucked last night? Okay! I’ll take that excuse! Yeah because an extra practice would have helped, haha. Yes, the Jets always make it “interesting.” When they solidly win it’s an event. Cowboys! Ugh! I remember when I was a kid the big rivalry was Cowboys/Steelers. I always went with the Steelers because my brother was a Cowboys fan. I remember Tony Dorsett and Danny White years. What a beautiful stadium they made there. Looked lovely on television. Sounds like a great weekend to me! Did you say Spaceballs? I haven’t seen the movie in a long, long time. Now you’re getting me wanting to watch it again! 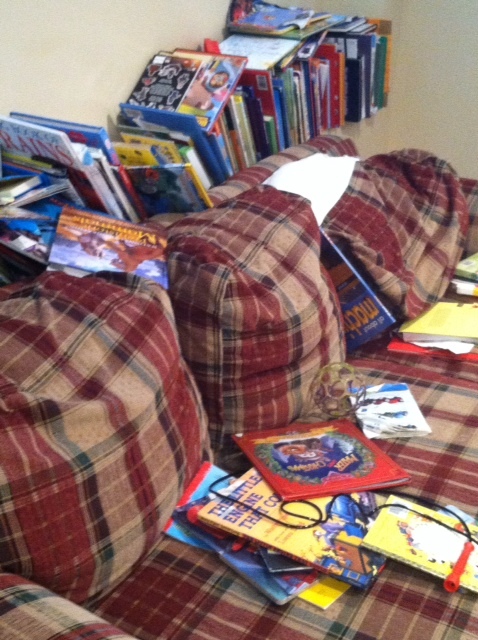 BTW, the couch with all the books on it? We have one just like it, but its light green. Man, now that I think of it, we’ve gotta toss that thing to the curb–it’s too old and tearing at the seams! Isn’t it great cleaning house of the old stuff? Our couch is torn at the seams too. 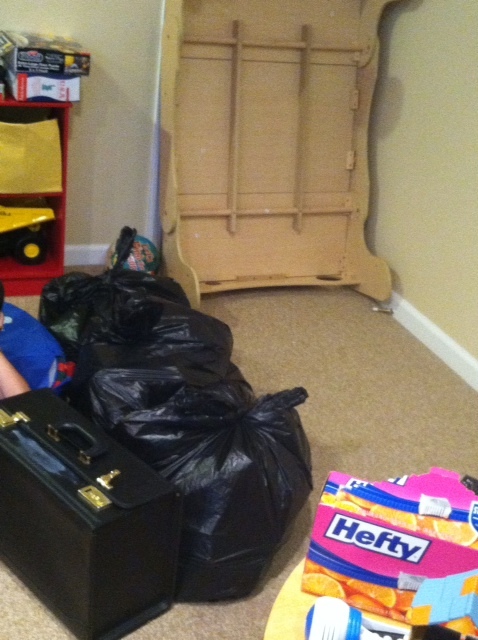 It was good for the basement playroom but now it’s really bad. Time for a new one. Too bad we don’t have a money tree in the backyard. Yes, Spaceballs! Such a good movie- I want to watch it again too.